What is the sequence for different Math courses? See the math placement website and take the Maplesoft math placement test to determine which level math course you should initially enroll in. The only math courses that will count as preparation for taking calculus are M065, M090, M095, M121 and M122, or M151. Where you start, M065-M162/171, depends on your Maplesoft placement score. The Math 171 and 172 (Calculus I and II) sequence are required. What Physics sequence should I take? Physics 205N/206N and 207N/208N vs. 215N/216N and 217N/218N The 215-217 series is calculus based, the 205-207 series is algebra based. Take the 215-217 series if you plan to take additional physics courses or go to graduate school. Some government agency jobs and graduate schools require calculus-based physics. Both 205 and 207 generally are offered every semester, whereas 215 (Physics with Calculus I) normally is offered only in the fall and 217 (Physics with Calculus II) tends to be offered only in the spring. The calculus-based series therefore requires a bit more schedule planning. The physics laboratories, 206N and 208N or 216N and 218N, are required for either sequence. What Chemistry sequence should I take? Either Chemistry 141N and 143N, or the CHMY 121N/123N/124N series, are required toward the B.S. in Geosciences degree. See the chemistry placement website to take the placement exam located at http://itoselect.ito.umt.edu/TakeSurvey.aspx?PageNumber=1&SurveyID=mlKI8594&Preview=true and review the information available there. A placement score of 13 or higher will enable you to start with CHMY 141N. A score of less than 13 will require that you start with CHMY 104. CHMY 104 is offered fall, CHMY 141N is offered fall and spring, and CHMY 143N is offered spring and summer. How can I fulfill my Computer Science requirement? This requirement is typically filled by courses offered in the computer science department. Some good options are CSCI 172, Introduction to Computer Modeling, or CSCI 125 Computation in the Sciences. GPHY 248 Intro to GIS and Cartography, or STAT 216 Introduction to Statistics, are also acceptable. Substitutions for this requirement must be approved in writing by a Department Advisor. What Upper Division Writing Course should I take? To satisfy General Education Requirements (GER) you must take an upper division writing course. The Geosciences degrees do not require that you take a specific course – you are allowed to take any course on campus that satisfies the upper division writing requirement. We recommend that you take a course that is relevant to science. Course offerings change from semester-to-semester, but courses to keep an eye out for include Global Water (GEO 320), Water Policy (taught in Geography) and occasional courses in Forestry. A senior thesis also satisfies the upper division writing requirement. What is the difference between a Senior Thesis and an Independent Study? An independent study is a self-teaching experience focused on a particular topic. You work with a professor to design the learning experience. For example, let’s say you decide that you are really interested in lahars (volcanic debris flows) but this topic is only covered briefly in our courses. You could work with a professor to design a learning experience focused on lahars. You might read papers and advanced text books about the topic and then compile a detailed set of notes and/or write a summary paper. These can usually be done in one semester. A senior thesis is an original research project. You work with a professor to design the research. You might collected original data or perform an original analysis of an existing data set. You then make an original interpretation of the data and your analysis. The write-up is a lengthy and detailed thesis where you present the methods, results, interpretations and conclusions. This usually takes two semesters – one semester to collect and analyze data and one semester to write the thesis. How do I conduct a Senior Thesis (GEO 499)? You approach a professor about working together on a project (normally at least one year before you expect to graduate). You need to find a match between your interests, skills and course preparation, and their research program. For example, if you want to work with a hydrologist then you should probably have taken courses in hydrology, math and programming because the nature of their research will require that you have this training. Can I register for geo 499 for both fall and spring semesters? How many credits is a senior thesis? Typically 3 in the fall and 3 in the spring. One semester for data collection and processing and one semester for writing. How are senior thesis grades determined? This is up to you and your advisor. You can receive separate grades for each semester, or you can carryover your project to the second semester and one grade can be assigned at the end of the spring semester for both semesters of work. Which Geosciences core courses are offered in Fall and/or Spring? 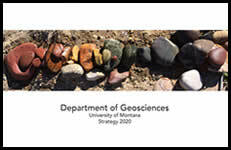 If I got a “D” in a geosciences course does it count toward my degree? No, it does not. In all courses required for the major you must receive a grade of C- or higher. How should I sequence the core (100-200 level) geosciences courses? Please see the flow chart, and discuss with an advisor.